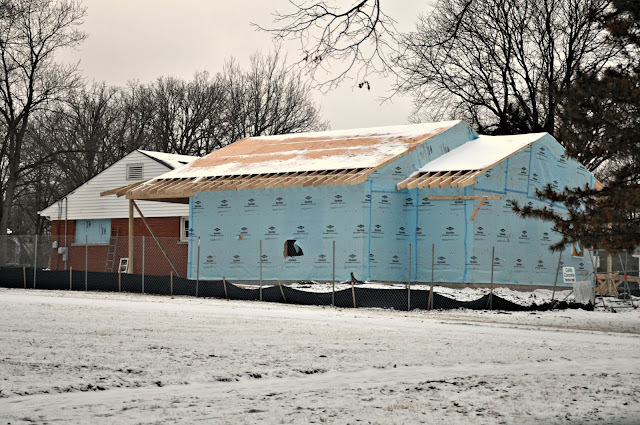 Hello from my still frozen, single digit temperature, midwestern farmhouse renovation! It has been a couple of weeks since my last update and to tell you the truth, since I'm at the site a couple of times each day, I don't always realize that progress is being made but after looking through these photos, there is a definite difference in how the house looks today. 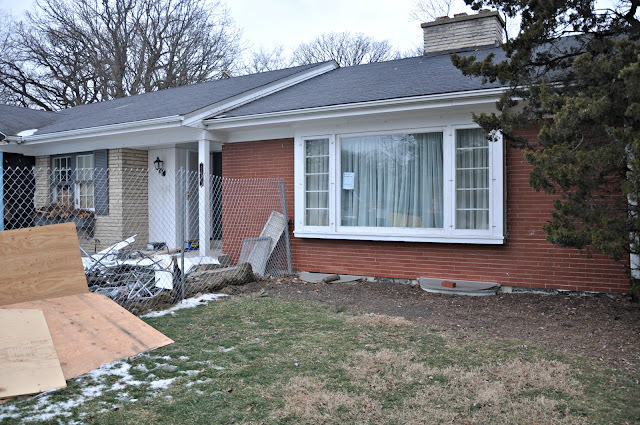 The first and second photos are of the larger of the two additions on the east side of the house. The first is looking at it from the south and the second is the view from the north. You can see the exposed rafter tails waiting for the bead board that will be visible from below. 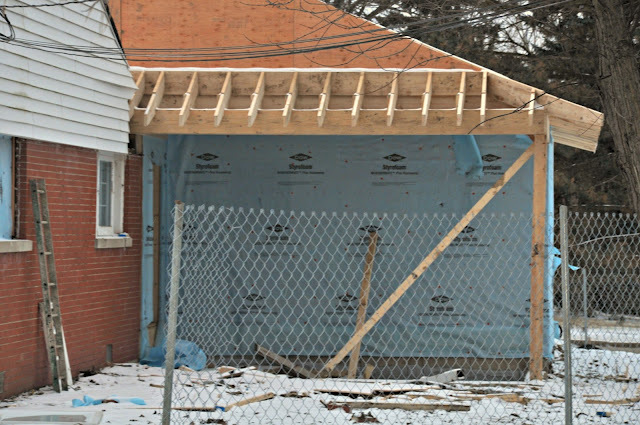 Once the bead board is installed, the rest of the plywood sheeting will go on, the roof will be felted and the metal roof will be installed.In the second photo, you can also see the covered porch that is along the north side of my new studio and the start of the new stone covered front entry. Below is how it looked ten days ago. I moved the front door "out" three feet to take care of some transition issues and to allow us to have a space that would act as an entry foyer. When I did that, the existing porch got really small so I decided to enlarge the covered entry and took the opportunity to add a little more limestone to the front of the house so that the materials would feel more cohesive. Here's a closer look. 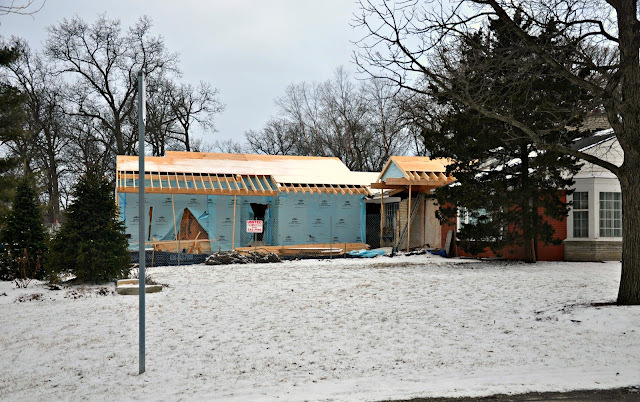 It will have an arched opening and stone all around that is yet to come but I love the way the new roof line makes the front of the house look less "flat". 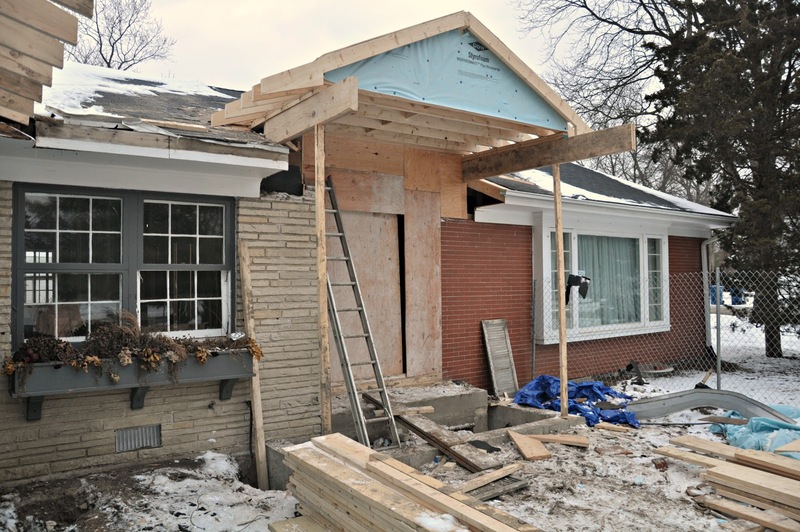 One more fun "before and after...below is the original breezeway that connected the house to the garage. 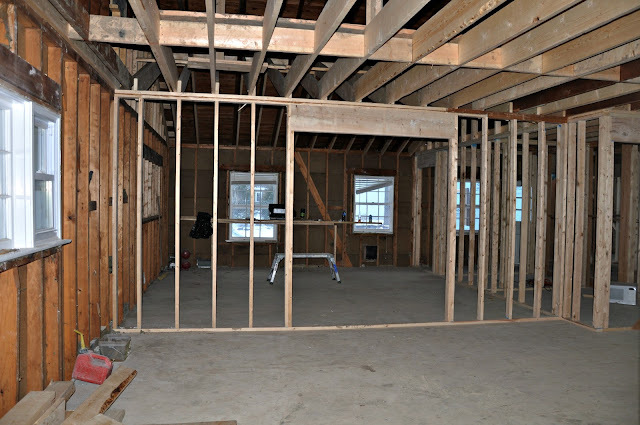 We used it as our mudroom when we moved into the farmhouse two and a half years ago but it will become our new master bedroom closet when this phase of the renovation is complete. 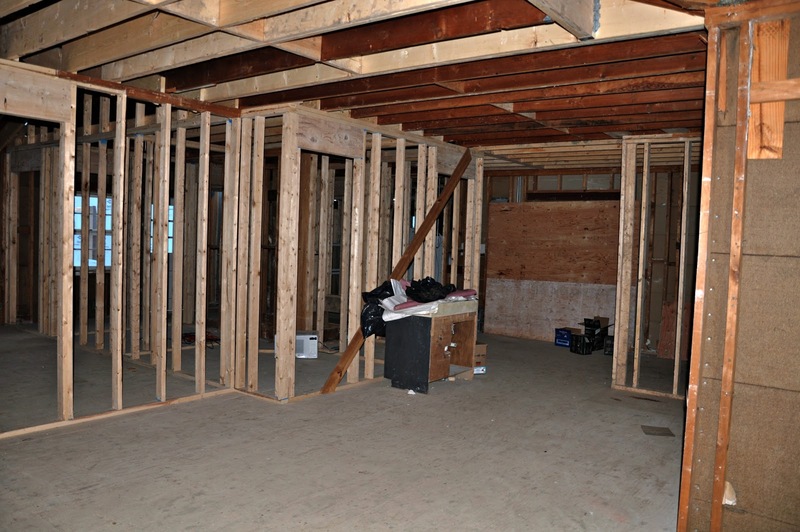 When we opened up the structure to frame the new floor, we discovered that the "walls" had no studs in them. Nope. Not one. 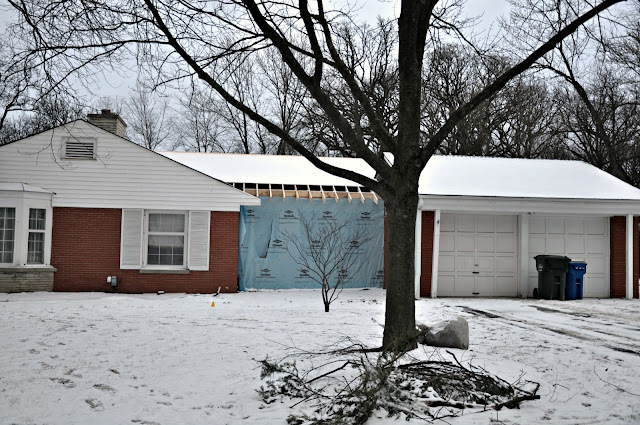 The windows were screwed into the roof header and the rest of the wall consisted of a layer of vinyl siding, a layer of solid insulation and a layer of plywood being held in place by quarter round. No wonder there were always spiders and other bugs making their way inside! Here's the new structure. It has real walls, three windows (openings behind the blue house wrap) and it too will have a metal roof. There is still more framing to be done on this side of the house including exposed rafters and a custom dovecote on the garage so stay tuned for that in a future post. This is a view that I haven't previously shared. It's one taken from the rear yard standing in front of my sweet little potting shed. 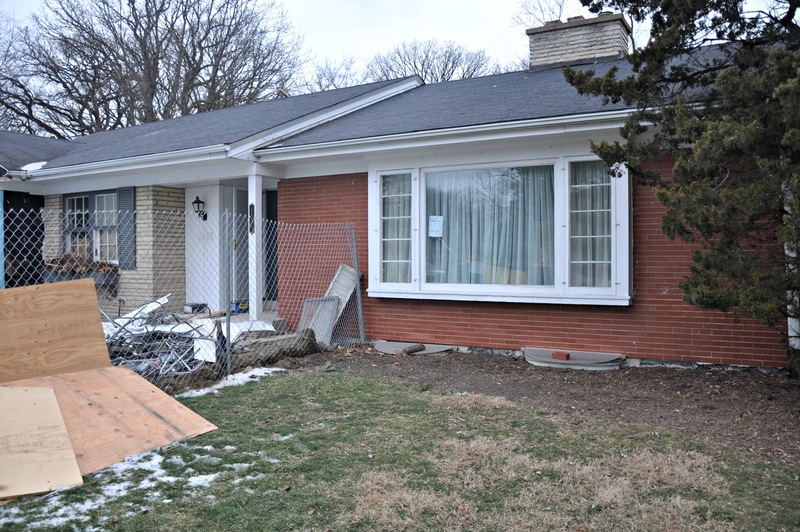 In this photo (from left to right) you can see the existing garage, the new rear addition , the existing brick house and the new addition in the front yard. Tucked in behind the new addition is a cute little covered porch that is just off of the kitchen. There's just enough room for a table and chairs or a love seat, a place for a grill, and a porch swing like I used to have when I was growing up. I can't wait! On the inside of the farmhouse, the framing is nearly complete. Above is the hearth room ceiling as well as my new walk in pantry and powder room. 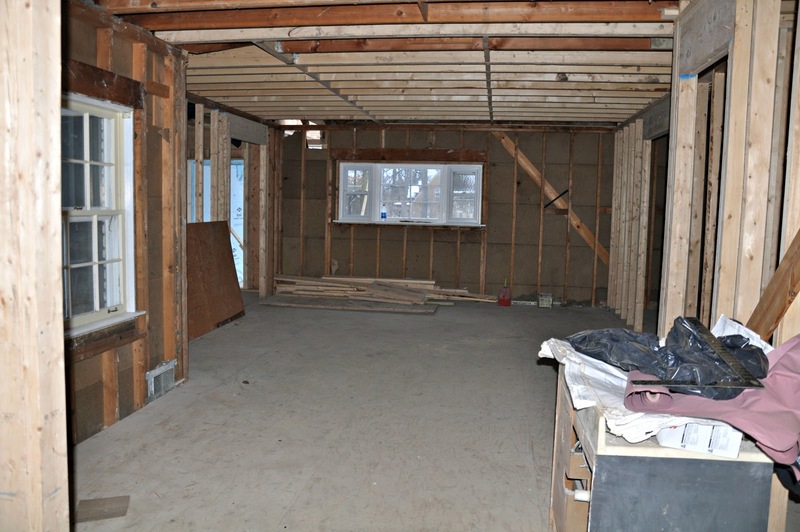 Below is the new kitchen space. I guess that I need to be more serious about cabinets soon. The window opening still needs to be moved over but I don't imagine that will happen for another week or two when the windows come in.This is the view standing in the kitchen looking at the hearth room. There will be a fireplace in the wall to the left where the window used to be. It's not started yet but they did remove the window and cover the opening today. And finally, the space that I'm most excited about, my new studio! There is plywood partially blocking one of the east windows and those huge sheets of plywood on the left are covering a 14 foot wall of windows that will face north. I've got big plans for these cathedral ceilings! There are only two of them but I intend to make them count (think reclaimed beams)! So, what comes next? 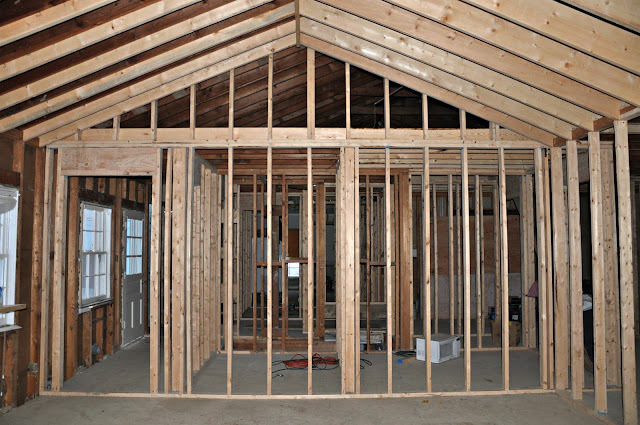 Well, the framers will finish the few odds and ends of interior framing in the next few days (things like the clothes bays in the closet, a built in niche for our television in the hearth room and the raised ceiling in the foyer. 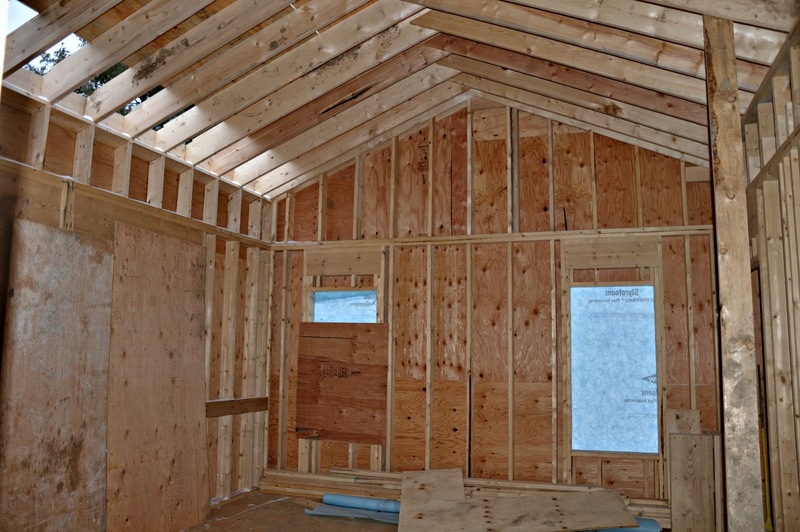 The roof will be sheeted, felted, and then, the plumbing rough in will start. 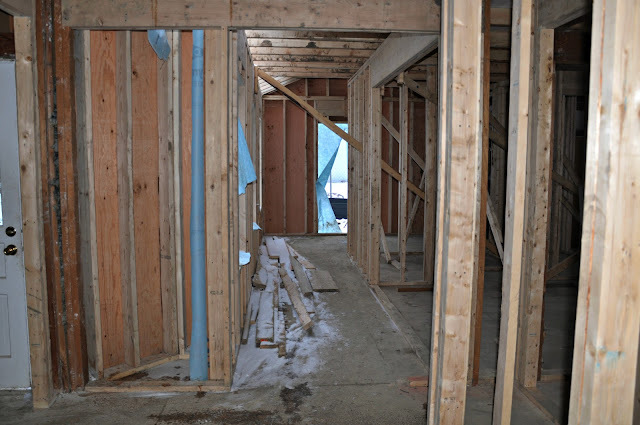 During the rough in, the plumber will run new waste lines to the kitchen, laundry room and bathrooms which will connect to the main sewer line and will replace the old iron lines that we removed. He will also run new water lines to all of the sinks, toilets and tubs as well as the washing machine, dishwasher and humidifiers on the furnaces. New water service will be connected in the spring when the ground thaws. The plumber will also install mixing valves in the walls for things like showers and tubs which is why I'm choosing plumbing now even though I'm a couple of months away from needing toilets, sinks or tubs. 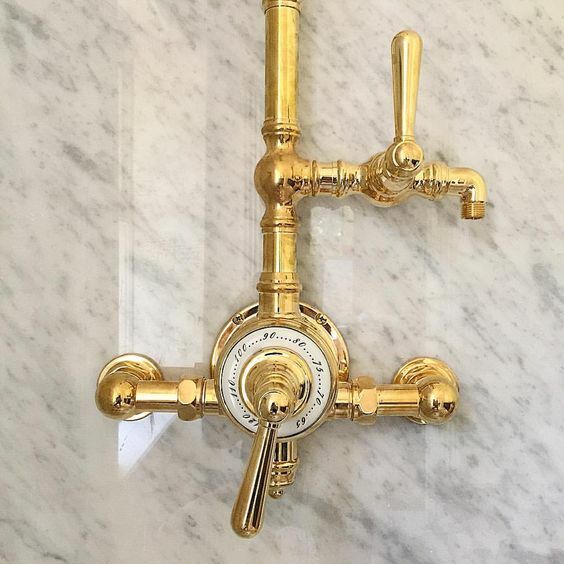 I'll share final faucet and fixture choices next week. 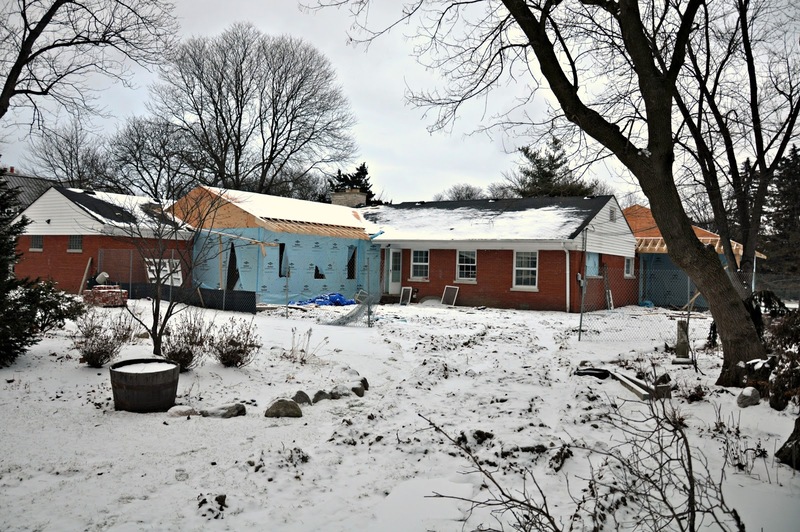 Around the same time, the new roofs (a combination of metal and shingle) will be installed and the windows should be here too! Also, I've ordered samples of four different shades of "white" for the siding and should have them at the beginning of next week so that I can make a decision and we can order the siding. Still to go: Figuring out the size for the windows that are behind the tub in our bathroom (see large beam and missing wall in the middle of the photo above because I can't decide) choosing interior doors, a new front door, the stone for around the front door and the porches and the KITCHEN (as well as heating air conditioning, electrical and what they call "low voltage" (things like wireless, security, and phone)). As you may have guessed, I've still got a lot to do and I had better get going!